In the battlefield, there are numerous soldiers fighting with all in their arsenal. Not only humans; tanks, war planes and everything else as well. The more powerful and versatile one with the best strategy is going to be victorious in the battle. Well, how about no humans, no battleships, no warplanes but just tanks? Why not just let the power of the cannons ROAR? That’s the experience you get on DatTank.io. Only the armored, massive beasts. The game is more like World of Tanks but set in the world of IO. Let’s jump right into the chaotic battlefield! In this game, you’re running a powerful tank in a map that’s filled with all the rocks, trees and other obstacles with all the scattered resources and a few checkpoints. These checkpoints are essentially powerful turrets that can fire heavy-damage cannon shots at the enemies. 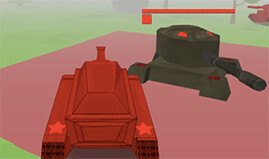 The graphics of the game is quite simplistic – classic, a plain 3D model with plain, simple surroundings. However, nothing is as simple as that. There are numerous enemies surrounding each of them trying their best to eliminate you and your team. When you spawn, you’ll be assigned a color – green, red, blue or others. While the same color tanks are your friends, others are your enemies. Your goal is destroying as many enemy tanks as possible while capturing all the available checkpoints. The game offers fluid, simplistic controls. The game may look simple but it offers a really difficult curve in the mid-game that makes it such an interesting one. At first, you start with a limited amount of ammo. Yes, you heard me right! In that sense, you can deal a limited number of damage to your enemies with only that much of ammo. Make sure that you don’t miss one! Another interesting factor is the heat. You can’t shoot all your ammo on a single kamikaze attempt! The more you shoot, the higher your cannon heats. Once you reach a heat threshold, you can’t fire anymore. You’re forced to evade or make any other tactical move while you replenish your ability for firing back. Ran out of ammo? Don’t worry. Carefully roam around the map. There are a number of available refillable scattered throughout the map – health, ammo etc. Once you’ve been in a brawl, take your time, refill your supply and go in again! As of resource, the only resource you can gather is the gold coins. Gold coins are necessary for purchasing better tanks with beefier, stronger stats. Using gold, you can also purchase other upgrades like a cannon (higher damage), engine (movement speed) and armor. I strongly recommend to save up your gold and then, get the strongest and the beefiest tank and weapon for the maximum power!